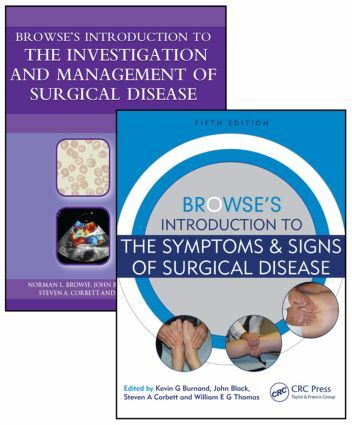 This set contains the latest edition of the world-renowned Browse's Introduction to the Symptoms & Signs of Surgical Disease together with its companion Browse's Introduction to the Investigation and Management of Surgical Disease. It provides complete coverage of the surgical curriculum at the undergraduate level and is also an ideal companion for candidates in preparation for MRCS and equivalent postgraduate examinations. Written for medical students and junior doctors, the fifth edition of this essential textbook has been fully revised and updated, including additional illustrations and photographs. The text teaches the clinical symptoms and signs of surgical disease, stressing the importance of a thorough history and bedside examination. Presenting the symptoms and signs in a formalized, systematic manner, it describes in detail the techniques of clinical examination, enabling students to elicit key symptoms and make sound clinical decisions. This volumeprovides clear insight into how the pathological features and extent of disease dictate necessary diagnostic investigations and treatment. Other key features include morethan 300 high-quality clinical photographs and 60 color line drawings to enhance textual explanations, as well as learning and review boxes to aid understanding and provide a tool for self-assessment. The bookis essential reading for all medical students undertaking a surgical rotation or preparing for their surgical exams.